If an electric current flows through a conductor in a magnetic field, the magnetic field exerts a transverse force on the moving charge carriers which tends to push them to one side of the conductor. This is most evident in a thin flat conductor as illustrated. A buildup of charge at the sides of the conductors will balance this magnetic influence, producing a measurable voltage between the two sides of the conductor. The presence of this measurable transverse voltage is called the Hall effect after E. H. Hall who discovered it in 1879. Note that the direction of the current I in the diagram is that of conventional current, so that the motion of electrons is in the opposite direction. That further confuses all the "right-hand rule" manipulations you have to go through to get the direction of the forces. where n = density of mobile charges and e = electron charge. The Hall effect can be used to measure magnetic fields with a Hall probe. 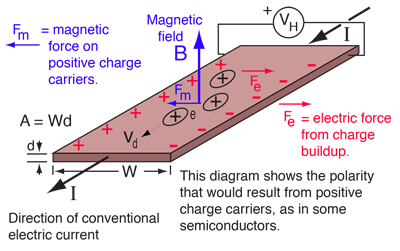 The transverse voltage (Hall effect) measured in a Hall probe has its origin in the magnetic force on a moving charge carrier. 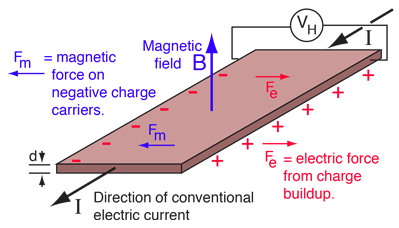 The magnetic force is Fm = evdB where vd is the drift velocity of the charge. The measurement of large magnetic fields on the order of a Tesla is often done by making use of the Hall effect. A thin film Hall probe is placed in the magnetic field and the transverse voltage (on the order of microvolts) is measured. and d = x10^ meters. 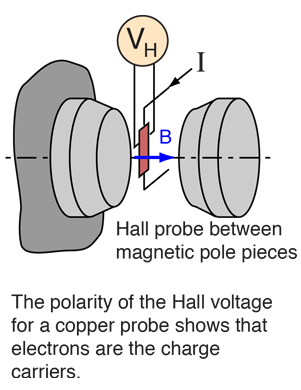 The Hall effect is a conduction phenomenon which is different for different charge carriers. In most common electrical applications, the conventional current is used partly because it makes no difference whether you consider positive or negative charge to be moving. But the Hall voltage has a different polarity for positive and negative charge carriers, and it has been used to study the details of conduction in semiconductors and other materials which show a combination of negative and positive charge carriers. The Hall effect can be used to measure the average drift velocity of the charge carriers by mechanically moving the Hall probe at different speeds until the Hall voltage disappears, showing that the charge carriers are now not moving with respect to the magnetic field. Other types of investigations of carrier behavior are studied in the quantum Hall effect.